During a polling session, the moderator/operator posts questions via the meeting room AV. Meeting participants using their Smartphones go to a secure website (www.joinp1.com) and enter a unique meeting number. From there, they view questions and enter single digit, multi-digit, or text responses. When the poll is complete, the moderator can post results instantly, allowing the speaker to share the results. Using PushOne software, the moderator/technician can generate various reports in MS Excel format for your review post-meeting. PushOne is available in a self-service version (Poller 2.0) and in full service meetings with an on-site technician. No downloads: Participants don’t have to download any application or software to their Smartphones. Only the moderator has a copy of the PushOne software on their Laptop. 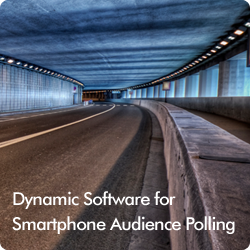 Compatible with PowerPoint™: Using PushOne software, import your PowerPoint slides to create your polling session. Speed: The PushOne system is fast - responses are registered in fractions of a second! Savings: You don’t have to purchase Clickers or Keypads, which results in savings. Supports multi-site meetings: Participants can be located in the same room or across the globe. Participants only need to have live audio or streaming video of the meeting, so they are cued when to vote.